CHARLOTTE, N.C.— Clemson’s undefeated unorthodox season faces a test on Saturday night versus Pittsburgh in the Atlantic Coast Conference Championship Game. The No. 2 Tigers (12-0, 8-0 ACC) come into a fourth consecutive conference title game looking to secure a fourth straight berth into the College Football Playoff, but aren’t overlooking the Panthers (7-5, 6-2 ACC) to get there. "Pitt definitely presents a big challenge for us," Clemson defensive tackle Christian Wilkins said. "They're a good team. There's a reason they won their division. We're going to have to bring it, be on our toes, be ready for anything." Wilkins and the rest of his teammates have fond memories of the last time these two teams squared off down in Death Valley. The Tigers’ 43-42 loss derailed a chance at an undefeated 2016 season with two games remaining, despite going on to win a national champion over top ranked Alabama. Pitt took that win to build momentum as a program and faces a similar storyline two years later. "We've come a long way since we played them down there," Pitt coach Pat Narduzzi said. "I think our depth is better. Any time you can go beat one of the best in the country, it gives your kids the belief that what we're doing is the right stuff. But the stars have to be aligned and you've got to do things right and have a little luck along the way." A first-ever ACC Championship appearance for Pitt since the conference adopted a divisional matchup format in 2005. The Panthers won four in a row to guarantee a trip to Charlotte before last week’s 24-3 loss at Miami. Three of the losses for Narduzzi’s team came against ranked non-conference opponents, including holding No. 3 Notre Dame to a season-low 19 points in a week nine defensive battle. Although, Pitt’s biggest challenge will be finding an edge on one of the best defensive teams in the nation featuring future NFL talents Christian Wilkins, Clelin Ferrell, Austin Bryant and Dexter Lawrence. Clemson has dominated their opponents this season especially against the run by allowing 84.8 yards per game, second in the nation to Michigan State. Also, the Tigers have allowed an average of 14.0 points per game—fourth-best in the nation behind Alabama, Fresno State and Mississippi State—all separated by less than two points. The Panthers try to find daylight with the duo of Qadree Ollison and Darrin Hall, who combined for 2,069 yards as part of the 16th ranked rushing attack in the nation. That being good for second in the ACC behind Clemson and Player of the Year Travis Etienne, who’s rushed for 1,307 yards and 19 touchdowns—the same amount scores for Ollison and Hall this season. Etienne may be having a record year, but Trevor Lawrence has come into his own after taking over as the starter in week five. The freshman quarterback has thrown for 2,488 yards for 22 touchdowns and four interceptions. Overall, Clemson’s powerful offense thrives with both playmakers as a balanced force. The Tigers average 283 yards passing and 256 yards rushing, along with 45.7 points per game. No. 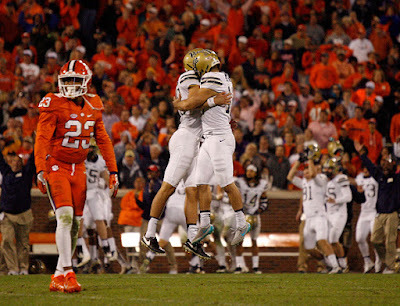 2 Clemson meets Pitt for the ACC Championship at Bank of America Stadium in Charlotte, N.C. on Saturday, Dec. 1.